By definition, a rare disease affects a small segment of the population, yet combined the 7,000 known rare diseases affect 30 million people — that’s 1 in 10 of us. Many Americans do not realize how common rare diseases are and that our community has tremendous unmet medical needs. On February 29, join together to raise your voice and make the voice of rare diseases heard. 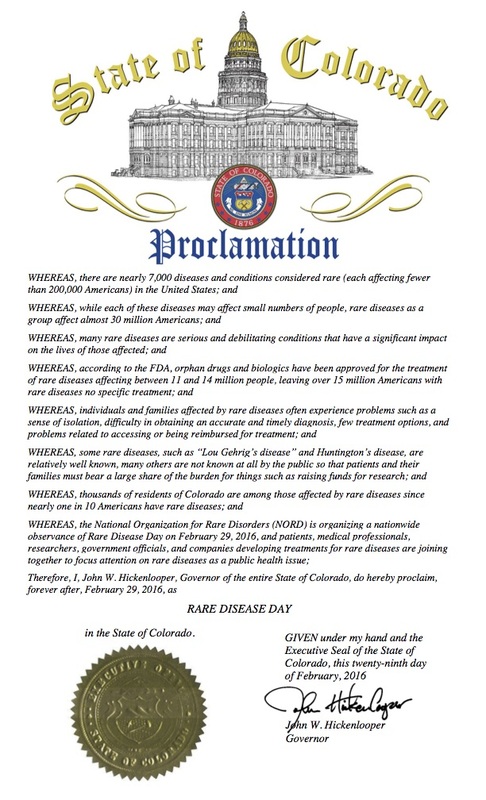 A request to declare February 29, 2016 as Rare Disease Day has already been submitted to Colorado’s Governor. We ask that you raise your voice and do the same for your state — all it takes it one person per state. Getting your governor’s proclamation is important because it raises awareness about orphan disorders like ours. It is very easy, but here are some tips to make it even easier. 1) Below is a select list of governor’s web sites. If your state is not listed, use Google or GoodSearch to find your state governor’s web site. There you will find the mailing address and contact numbers. This is the best way to submit a formal request. Here is a downloadable letter that you can customize and mail. Purpose of Proclamation: To raise awareness about rare diseases such as Mal de Débarquement Syndrome among citizens of [Your State]. Draft Language for the Proclamation. Here is a downloadable document with sample language, provided by NORD/EURORDIS (National Organization for Rare Disorders and Rare Diseases Europe). Be sure to fill in your state’s name. The date requested needs to say February 29, 2016. Alaska – requests are reviewed 1 month in advance of the date requested. Delaware – allow 2 weeks for Proclamations to be processed. Louisiana – contact the governor of LA or contact Kristen Angell at NORD. Montana – contact the governor of MT or contact Kristen Angell at NORD. Nebraska, North Dakota, Rhode Island, West Virginia, Wyoming residents may contact Kristen Angell (link above). If you would like us to help you find and contact your governor’s office, let us know. Together we’ll figure it out. Some states need up to 2 months to process a request, and we are already behind the 8-ball! So let’s get marching! Rare Disease Day was first observed in Europe in 2008. It was established by EURORDIS, the European Rare Disease Organization. In 2009, EURORDIS asked NORD to be its partner in this initiative and to sponsor Rare Disease Day in the United States. Now, the concept is rippling out around the world. In 2011, over 60 countries participated. Each year, World Rare Disease Day will be observed on the last day of February (Feb. 29 in leap years and Feb. 28 in other years). Our goal is to draw attention to rare diseases as an important public health issue that cannot be ignored. To learn more about the global initiatives supported through Rare Disease Day please visit www.rarediseaseday.org. The State of Colorado proclaimed 2/29/2016 Rare Disease Day. Thank you, Governor Hickenlooper! 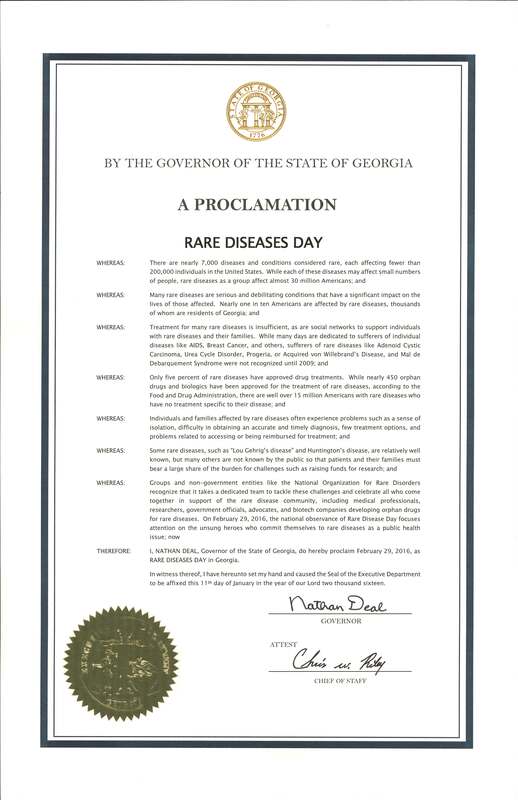 The State of Georgia has proclaimed 2/29/2016 Rare Diseases Day. Thank you, Eileen!